In July 1940, Thomas H. Davis purchased Camel City Flying Service in Winston-Salem, N.C. and changed the name to Piedmont Aviation. Piedmont sold and serviced general aviation aircraft and throughout the war years, trained flight students under the War Department Civilian Pilot Training Program. On D-Day in 1944, Tom Davis filed an application with the Civil Aeronautics Board to conduct scheduled local service operations in the Southeast. It wasn’t until April 4, 1947 that Piedmont was authorized to operate a local feeder air carrier over routes linking the tidewater cities of North Carolina with the Ohio River Valley. The authorization was contested but after litigation all the way to the U.S. Supreme Court, the decision was upheld. On January 1, 1948 the Airline Division of Piedmont Aviation was formed and passenger service began the following month on February 20. It didn’t quite reach that level of growth; however, in April 1959 it was changed from an in-house 8.5″ x 11″ publication to a larger newspaper style format published by a commercial printer. In 1951, a contest was held among the employees to name the newsletter. In September of that year the name “Piedmonitor” was chosen from among those submitted. The winner was a young female station agent in Charlotte, N.C. 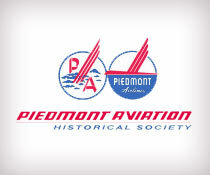 The Piedmont Aviation Historical Society was established in 1991 by Tom Davis to, among other things, preserve the company archives. We are fortunate to have almost all the newsletters that were published throughout the years and they are here for all to enjoy.